Drown The Gown - Moments In Time Photography, N.Z. Becoming more popular in New Zealand, ‘Drown the Gown’ or ‘Trash the Dress’ are unique photoshoots for a bride in her wedding dress. Usually arranged a day or two after the wedding, or sometimes longer (some brides like to include it as part of their first year anniversary celebration) a ‘drown the gown’ session is usually set at a river or at the beach and the bride once again puts on her wedding gown and with direction from her photographer (and great attention given to safety) proceeds to ‘drown her gown’. 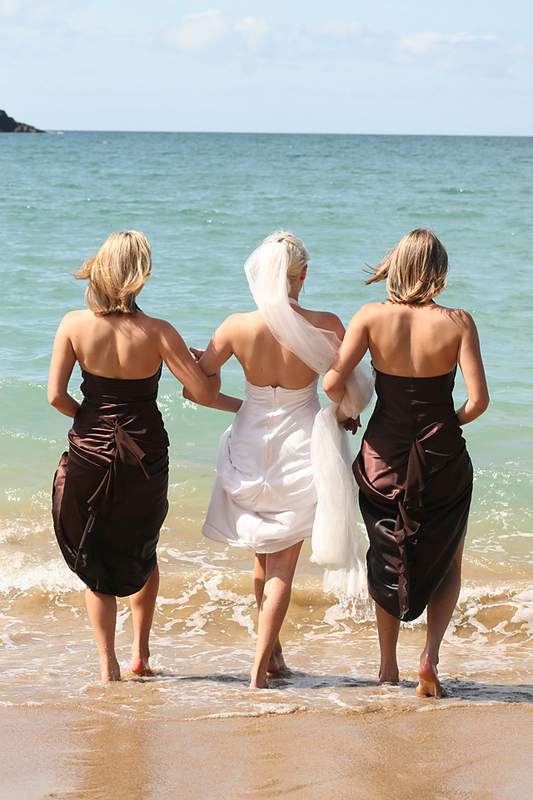 Some brides even include their bridesmaids or the bridal party! It is said that this is a symbol of her undying love for her new husband by showing that she will never need her wedding gown again (although after a good dry-cleaning most dresses are none-the-worse for wear after the drown the gown shoot and can be stored or sold as wished). The images produced are unique, evocative and often poignantly beautiful. 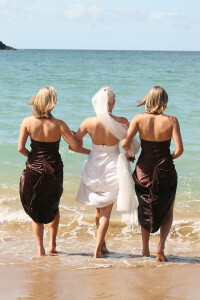 These shoots can really be fun, why not get the bridesmaids or the whole wedding party involved! And if you’re wedding day has been and gone, what better way to bring back those memories of your special day, why not get dressed up again and have some fun in that beautiful dress! Trash the Dress is along the same lines but this is where a bride has a portrait shoot done in settings one might not ordinarily expect a bride to go in her beautiful white gown. The harsher backgrounds of grafiti covered derelict buildings, a grease covered mechanics workshop or any number of places makes the delicate beauty of both the bride and her gown stand out even more than when the bride is in a beautiful background. Just like the ‘drown the gown’ shoot many brides feel the ‘trash the dress’ session is their statement that they will never be needing a wedding dress again, they know that this love is for life, they are totally comitted and there will only ever be one husband for them, so they’re going to make the most of the ‘moment’. After all what else are you going to do with your dress? Wrap it up in plastic and put it in the back of the wardrobe? And no, your daughter wont want to wear it in 20 odd years time! Why not have fun with it and capture some amazing images while you’re there! ‘Trash the Dress’ or ‘Drown the Gown’ may sound a little drastic but in fact it isn’t usually to be taken literally, after the photoshoot a trip to the dry cleaners will often have your wedding dress looking as good as new. A minority of brides take the term literally and may take to their gown with a pair of scissors etc but most just want a fun shoot that does no real damage to the dress. We love the drama and uniqueness of the ‘drown the gown’ and ‘trash the dress’ shoots and are happy to offer a 1-2 hour portrait session, with all of your image as high resolution files (ready for printing) on disc. Package also includes photoshop digital enhancement at no extra cost and an A3 enlargement of your favourite shot. Email us at: fotographer.nz@gmail.com for any futher information or to make a booking.